Add the salt,pepper and flour to a large ziploc bag. Add the chicken pieces and toss. Refrigerate for a half an hour then shake the bag again. Heat canola oil to 375 degrees. Add the chicken about 10 pieces at a time to the hot oil. In a small saucepan add the mustard, honey, bbq sauce and whole grain mustard. Heat on low and stir until combined and just bubbling. 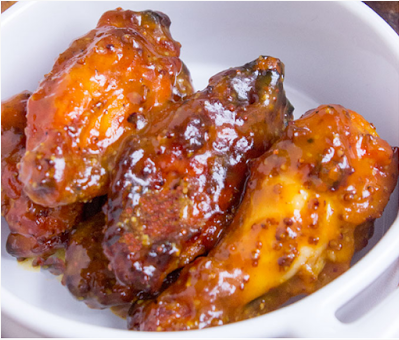 Toss the wings with the honey mustard bbq sauce and serve immediately. 0 Response to "Honey Mustard BBQ Chicken Wings"